I WANTED ALL THREE BEE GEES! This week’s story is from a lady who spread the love around for all the brothers. I can understand that because how can anyone pick one brother over the other? So hard to choose when they’re all so fabulous. I see that most fans favor one Bee Gee over the other two. There are great reasons for this; and I understand it, but I was a flighty little thing when I was a young girl, and I never stuck with one of them because they were all so wonderful! 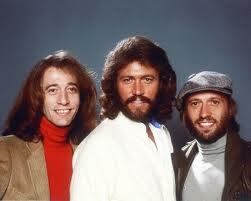 I wanted to marry ALL of the Bee Gees at one time or another. I would waver from one to the other. First it was Barry because he was so gorgeous and perfect and bigger than life. I think I was 8 at the time. Then in middle school, I started to gravitate toward Robin because I loved his voice. He was different and smart, and I sighed a lot when he sang to me. He was incredibly sweet. By the time I got to high school, I started to appreciate Maurice much more. I was a music student, and I watched him perform and thought he was like the unsung hero, like the everyman, I guess. I felt so drawn to him, and I played the piano myself and would imagine him sitting next to me on the piano bench telling me I was talented while I played “To Love Somebody”. I know that when I look back on this, my hormones must have been controlling my heart, but I truly loved the music, especially the love songs and the sad songs. I was emotional and would write love letters to the brothers. Then I went through my poetry phase and imagined myself reading my love poems that I’d write while I sat on my bed at night. I would speak them aloud and talk to each brother and write special poems for each of them. I don’t think I ever liked any other pop group, although I listened to them, but no one else triggered my emotions or made my heart flutter. I was a lucky girl in the late 70’s and am still a lucky woman now. I have hundreds of memories that make me laugh and smile. A great sense of humor is the best part about a man, I think, and I love the humor and all the great laughs. I laughed through six concerts and can’t count the times one of them cracked me up with a one-liner during a performance or TV show. They possessed the greatest sense of fun of anyone in the music business. So, I appreciate every single laugh and every sigh of love the brothers have given me since I was eight-years-old. I still replay the humorous moments in my head because humor gets me through all the challenges in life, and Bee Gee humor is the best kind. No one can tell me there’s someone funnier than Robin or sillier than Maurice or anyone with a better sense of humor than Barry. Time and time again, I think of moments where they brought smiles and laughter to my world, and I thank them every day. It’s been a great life with these men. I love them all and always will. 14 Responses to I WANTED ALL THREE BEE GEES! Aww………that was so, so sweet. You must have a heart as big as all outdoors. I agree, Carolyn. Bee Gee fans are all heart and soul and I love talking with them and hearing their thoughts. So glad you like my site and the stories fans tell me. They are the best. If you are going to concert in LA, we will have some fan gatherings there. Would love to meet you and all the fans in LA come June. It’s always useful to read through content from other writers and practice a little something from other web sites. I try…with love from fans! this website is truly good and the viewers are actually sharing nice thoughts.